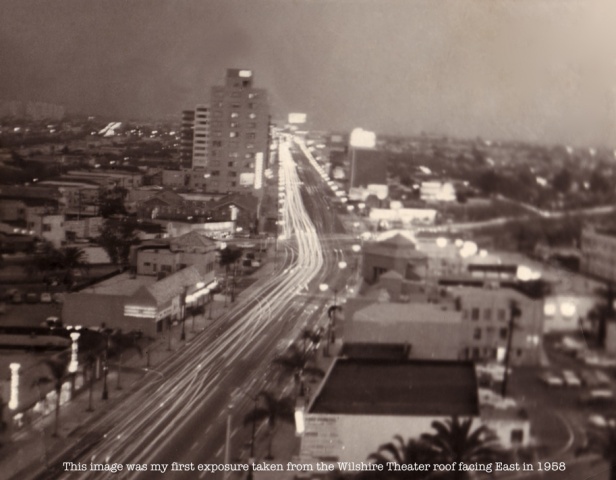 Facing East from the roof of the Beverly Hills-Wilshire theater (an evening circa 1958) this is was my very first image I had recorded after receiving the gift of a camera from the Walt Disney Corp. Just for the fun of it, I was instructed to hold the shutter wide open for a long exposure. After having the film processed, and amazed about what was exposed, from that moment on I have been enthusiastically infatuated with photography as an art medium. That little amateurish box camera opened up a whole new life for me and I have been enjoying the art of imagery recording since. Thanks to George Eastman (with the Brownie) and Nicéphore Niépce (the inventor of the first permanent photo etching in 1822) I'm eternally grateful. I swiftly abandoned my trusty old paintbrushes and pencils for the love of a photographing camera which eventually evolved into both digital and film formats.